If I had my way, I would pick up every brown eyeshadow and every neutral eyes palette, so it shouldn't be a shocker that MAC's Soba eyeshadow finds a spot in my list of MAC must-haves. 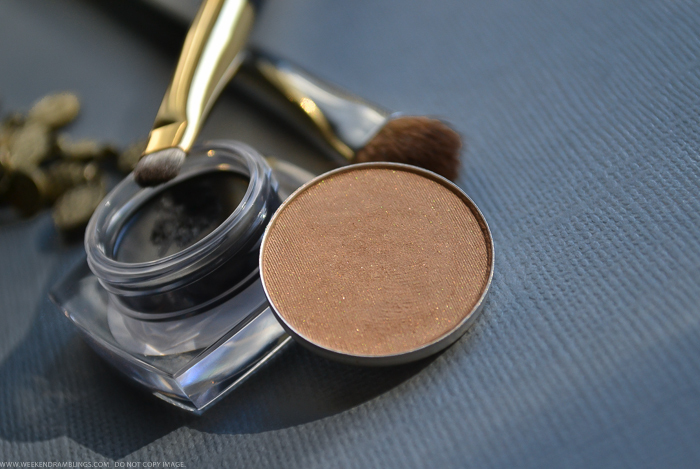 This is a satin finish warm golden brown eyeshadow with a bit of golden shimmer mixed in. 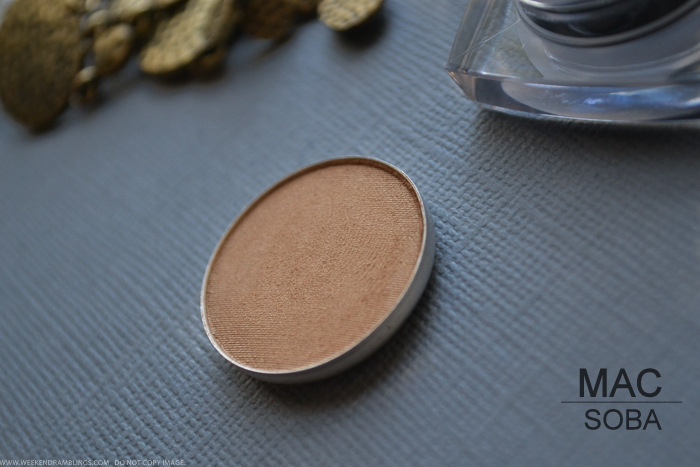 The color is great for knocking out the ashy darkness on my eyelids, and it's a perfect pick for me to use as an all-over lid color. There is a bit of a fine golden shimmer mixed into the shadow. The shimmer is quite subtle and just gives a bit of sparkle and not big chunky glitter/shimmer. This is quite pigmented, though it might not look that way in the swatch. The color is pretty close to my skin tone so it is a little difficult to show in photos. Wearing MAC Soba all over my lids. Also used: Maybelline Black Gel liner smudged along lashline. 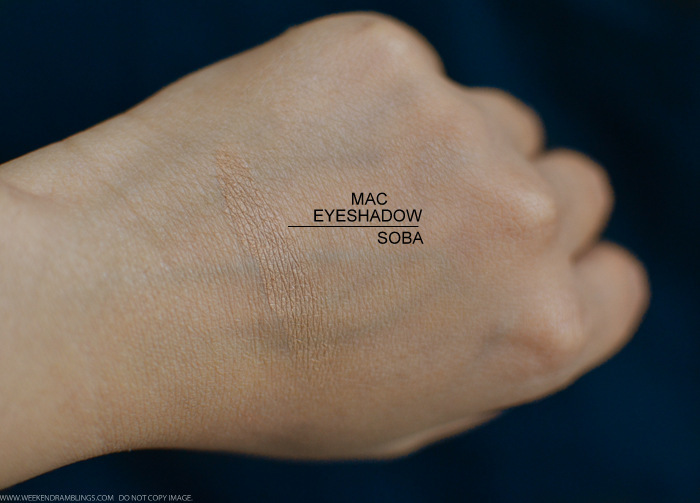 MAC Soba is one of those colors that is easy to overlook, especially when there are brighter, shinier colors around. If you ask me, though, this is definitely one to have in your makeup palette. For my darker eyelids, this is great as an all-over lid color and also works great as a transition color along the crease to blend out smokey/darker eye looks. 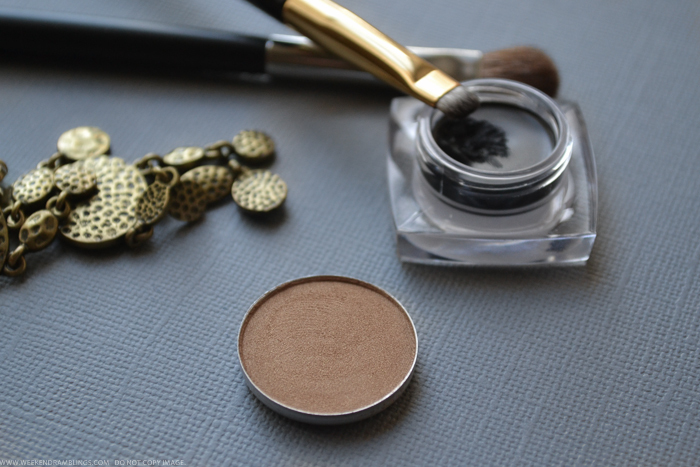 The shadow is easy to blend, and over a primer, the eyeshadow lasts the whole day on my lids. I absolutely adore this shade for everyday wear! 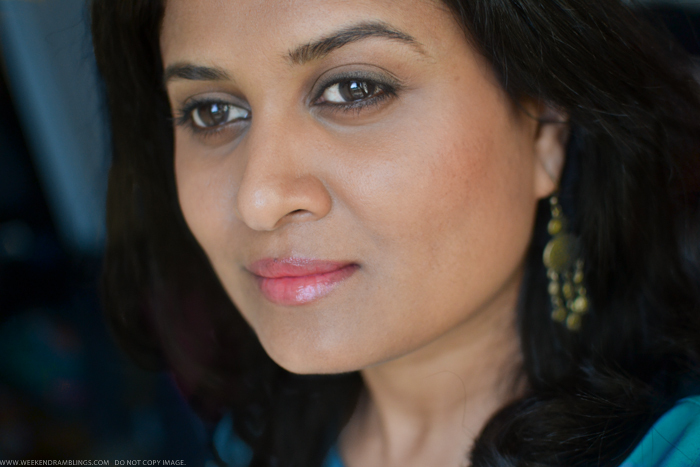 Radhika, have you tried Ground Brown, Handwritten and Saddle? They are all gorgeous browns from MAC. Although Saddle is virtually impossible to get hold of in India. Not sure if it has been discontinued. Handwritten doesn't like me..I have been wanting to get a refill pan for ages, but every time I go to the store they only have the regular size - nonrefill type. I might have to order it online now.. It really brightens and opens up your eyes!!! On my lighter yellower lids it only really adds a shimmer. I use it with All that Glitters and Sable in a blendy look sometimes. (ATG inner lid, S outer corner, Soba crease). ATG looks too sheer on my skin...or maybe it's just because some of the testers tend to be dried out..I should give it another try. You eye makeup combination sounds nice! OMG such a pretty shade and it looks so ahmazing on you !! I guess this will be my next mac eyeshadow since I am on a lookout for a something to wear during the day ! !